Today was a very busy day! We started with a 6:30 am wake up call and set out to hike Cerro Ancon, a hill on the outskirts of Casco Viejo where we are staying. Not only did the hike offer beautiful views of Panama City and Casco, but it was rich in historical value from when the Americans forces occupied Panama’s Canal Zone. There was interesting information about bunkers built into the hill as a precaution for potential attacks on the canal during WWII. Having studied European History extensively, I was fascinated by the impact it has had as far as Central America. I am constantly in awe of the beauty of Panama’s flora and fauna, as well as skyline and overall wonder. The hike allowed us to appreciate all of the above, and even see a toucan! Next, we headed to the University of Panama to teach a class to the dance majors studying there. This was my first time experiencing dance in a university setting internationally! Sam and Aja taught a hip hop routine, including improvisation at the start. It was so fun to see the Panamanian dance majors, our peers, throw themselves into the choreography and improvise alongside us and with us. Their passion and dedication was clear, and it was inspiring to us all as dancer majors and dance diplomats. Finally, we returned to Aldea orphanage to teach again. Today was special, because they remembered us and were familiar faces to us as well. Many even remembered our names! Teaching felt a lot more natural, and I felt my Spanish growing stronger. Growing up in a Spanish immersion program, I have a background in Spanish that I am hoping to improve, especially my conversational skills. Speaking with the kids is so beneficial as they are not afraid to correct you or tell you the word you are searching for! I love watching my fellow dance diplomats teach, and I feel so much love and support from each of them when I am teaching in turn. The environment here is so comfortable and kind, and truly fosters learning and growth. Watching them interact with the children warms my heart, and I can see everyone is truly invested in the mission of this organization. Our day at Aldea was bittersweet however, because we had to say goodbye to the kids we met. They were each so unique and beautiful and several tears were shed by the dance diplomats of love and appreciation for our time with them. I felt such a strong connection to the students instantly, through their warm smiles, physical affection, and enthusiasm for life. I am so thankful to Movement Exchange for fostering such a loving environment that is such a rewarding experience. As an international studies and dance double major, it is fascinating to me to see how dance connects to global citizenship, the nationality and culture of a nation, and the impact the arts have on a nation’s identity. It is truly amazing to be able to communicate with another nation simply through movement and expression, and no words. I am especially thankful for this opportunity to combine both my passions in this way. 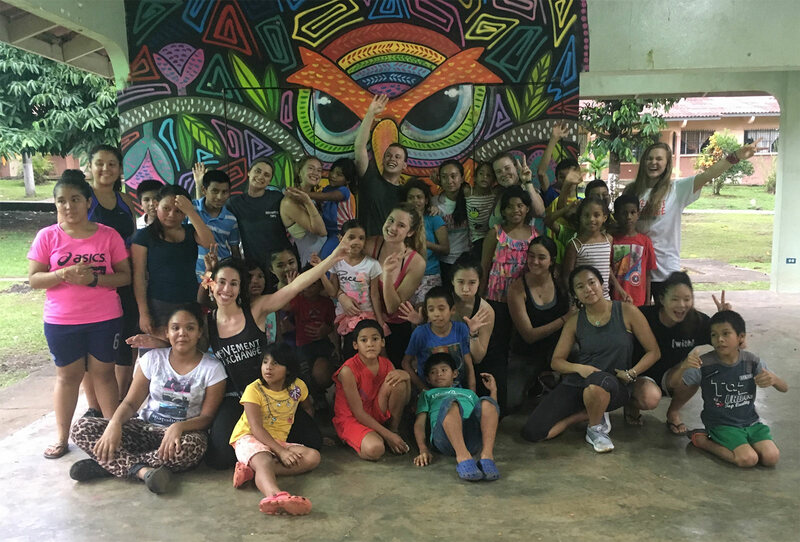 I will remember my time teaching, dancing, and learning about Panama firsthand forever!